Evap·o·rate, to pass off in vapor or in minute particles. All evaporative cooling rely on the energy required for the evaporation of water to absorb heat from the air and lower the temperature. This is due to the very high enthalpy of vaporization of water, the phase transition between the liquid and the gaseous state requires in fact a large amount of energy (which is more properly called enthalpy) that is taken from the air in the form of sensible heat (which is the temperature, something we feel with our skin and determines our comfort) and it is converted into latent heat (which is an energy “hidden” in the vapor component of the air). The result of this adiabatic process is a drop in the temperature of air and an increase in its humidity, therefore it’s clear that this cooling system is particularly effective in dry and hot climate zones where the higher humidity and the lower temperature can be both seen as advantages. Clearly the evaporating process is a key also for some convective cooling processes (that we treated here) but they rely also on the reduced buoyancy of cooler and more humid air to obtain the final effect while evaporative cooling techniques only rely on the evaporation of water. Although primitive evaporative techniques were used in ancient times (in combination with convective and ventilation devices like windcatchers and qanats in iran) and porous water jars are still used in many hot areas in combination with Mashrabiya other ventilation apertures to naturally cool down the interior of buildings the use of evaporation to cool down outdoor spaces is very recent. Evaporative cooling depends largely on how effective we are able to evaporate water, and a basic physical variable plays a big role in this case: surface-area-to-volume ratio, the more surface area we are able to expose the more energy we are able to exchange. There are basically two ways to proceed nowadays to maximize the surface area, evaporative pads and misting. Evaporative pads are generally used in evaporative cooling machines oriented to indoor cooling, these pads are cheap and effective but they are relatively fragile, require continuous maintenance and are most effective in controlled environments where the airflow can be adjusted and controlled, the “wetpads” are made of porous materials that have to be maintained wet while air passes through. 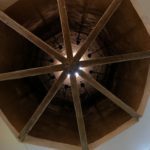 The peculiar structure of these materials offers the largest possible surface area to the passing air which is then humidified and pushed into the building or the room. This technique can’t be used for outdoor cooling clearly because of the required control to the ariflow that is necessary. Con·vec·tion. Convection results from the tendency of most fluids to expand when heated. 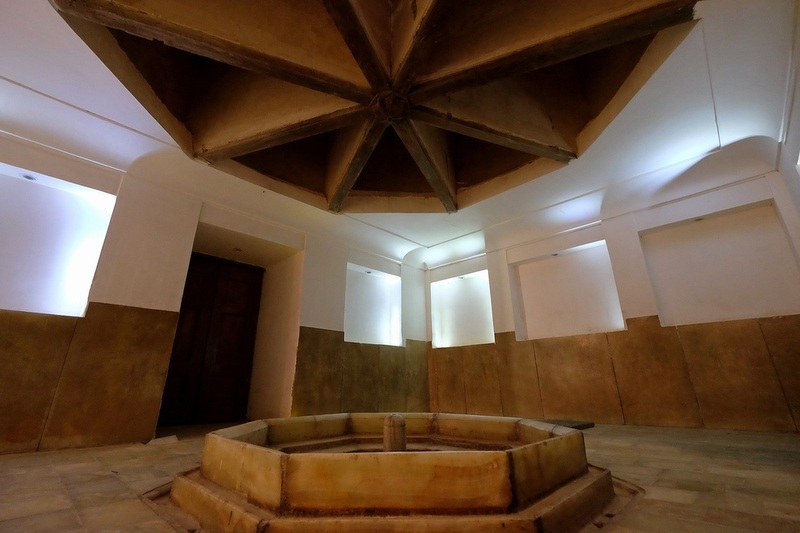 The use of convective air flows with the purpose of cooling traditional houses was not alien to traditional Persian and middle eastern architecture. 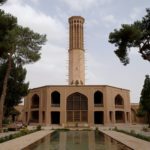 Joining the “simple” badgir ventilation system with more refined and complex cooling technologies was one of the most advanced points reached by Persian/Iranian building knowledge. Passive cooling systems in the Yazd desert were so advanced that iced formed (and accumulated) during the cold winters could be conserved frozen until the height of the long, hot, desertic summer. In addition to sensible cooling, the cooling caused by a change of air temperature but not its humidity, badgir combined with a savvy use of water can provide also evaporative cooling which is generally more effective than sensible cooling alone. In order to do so, windcatchers have to work together with a water source that supplies water which is then evaporated cooling down the flowing air, this can be achieved in many ways. The first one is taking advantage of the of the basement damp walls of the windcacher itself, if there is enough humidity in the underground the basement walls will be constantly wet and when the wind tower is working as an air intake the evaporation of the thin superficial layer of water will cool down the downward incoming stream of air. The second solution is to put a water source, if available, right under the shaft of the tower, a fountain or a small pool is used in this case, sensibly and evaporatively cooling down the entering wind. 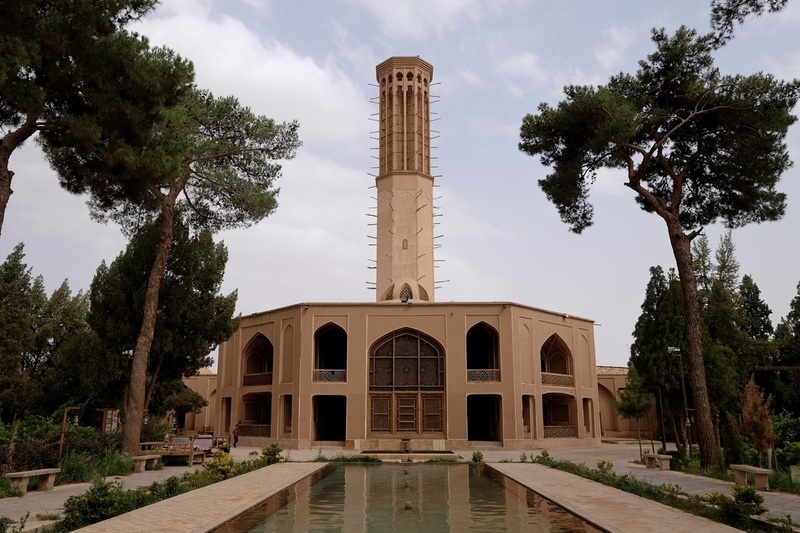 A great example, found in Yazd, combines and refines even more these two methods placing the tower further than usual from the house (50 m) and then using an underground tunnel to connect the tower with the house. 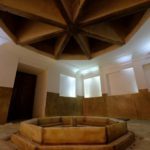 The tunnel, being underground benefits both from the earth thermal inertia and from the humidity of the soil and at the end of the tunnel a fountain is placed to cool down even more the air. The third, and more advanced, passive cooling system based on windcatchers benefits from an underground water stream to cool down the water. The use of convection with the purpose of cooling public space is mostly centered on evaporative towers, in a normal evaporative (cooling) tower hot water is distributed in the upper part of the tower, the sprayed hot water release heat in the atmosphere condensing and flowing down to the bottom of the tower where it is collected and recirculated if it’s the case. In evaporative towers designed to cool the surrounding space the process is inverted, cool water is sprayed with nozzles at the top of the tower and rapidly evaporating absorbs energy from the air coming in from the top of the tower, the cooler and more humid air being denser descends to the bottom and causing the area above it to cool down. The design of an evaporative tower able to work properly is challenging, a single design flaw or dysfunction can cause the sprayed water to condensate an drip. Ven·ti·late. The natural or mechanically induced movement of fresh air into or through an enclosed space. Natural ventilation was widely used in traditional architecture to improve the bioclimatic comfort of tents first, and then rooms and whole houses, before the advent of air conditioning, natural ventilation was one of the few techniques available to lower the temperature of a closed space exploiting the cooler winds blowing outside or just the movement of cooler air. The first and most important examples of architectures using the wind as a cooling medium to improve indoor environmental conditions are found in Persian traditional architecture, the badgir (or mulqaf in arab) is an extraordinary piece of spontaneous design, using only the natural flow of the wind – naturally combined with many other bioclimatic arrangements like thick insulating walls, very packed constructions, small apertures, etc. – it is capable of cooling and improving the climatic comfort of a house in the torrid deserts of Iran and the Arabic Peninsula. 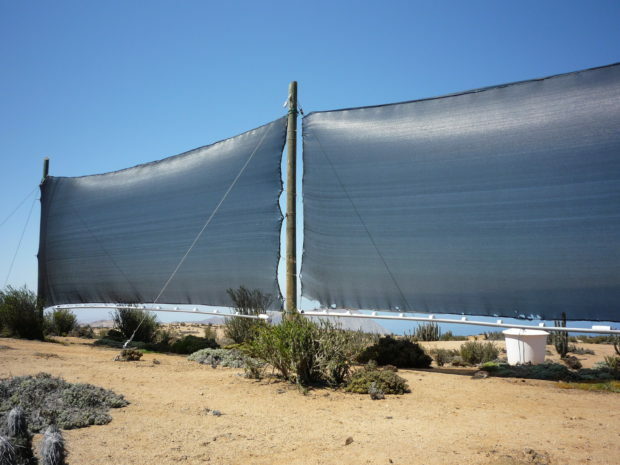 The badgir, in arid and dry climates is often combined with the use of water to implement evaporative cooling improving even more its cooling capacity and generating cool breezes even without the presence of winds outside, in this case the thermodynamic effect is not based only on ventilation but also on convection. 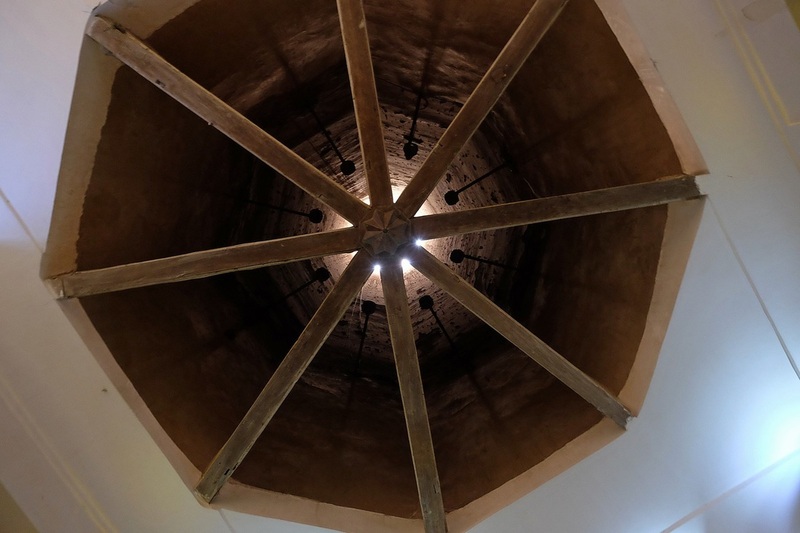 The windtower, or literally windcatchers, can be found as a traditional element in most of the modern Islamic world area with few regional variations, its usage has been consistent through the ages but in the western gulf area it almost disappeared due to the rapid urban growth and modernization of the cities, in Bahrain, for example, only one ancient badgir remains. Direct solar radiation has the largest impact on the comfort in open spaces, the enormous energy of the sunlight can be useful in certain seasons and cold climates but is generally excessive and certainly unwanted in hot and arid climates. Sun shading, and sun protection, has been, and still is, the fundamental way to improve a public space bio-climatic behavior. Reducing the solar radiation that reaches the people or gets reflected by the ground, both by the means of vegetation or shading artifacts, is the most efficient way to reduce temperature and it is widely used at all latitudes from temperate areas to arid ones. 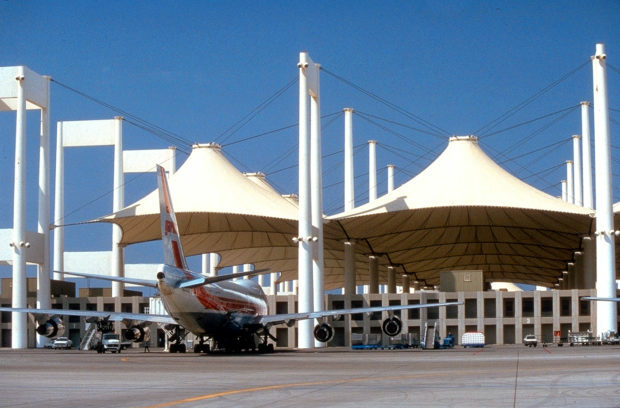 A milestone project in the use of shading devices to create a bioclimatic space in the gulf region is the Hajj Terminal part of the King Abdulaziz International Airport, designed by the NYC based firm S.O.M. architects. The use of tensile structures, wasn’t surely something new at the time (i.e. Frei Otto tensile structures for the Olympic games in Munich date back to 1972) but the scale and the effectiveness of this project made it one of the best and most replicated examples of open shaded spaces. Although not being a true public space the Hajj terminal is quite peculiar, designed to host the massive flow of pilgrims that pass by during the ritual pilgrimage to the Holy Mecca it is composed of two parts, the first is a fully air-conditioned terminal where the offices, customs, and luggage claiming areas are hosted and the second, and far more interesting part, is the famous open space tent-like structure that hosts the pilgrims until their departure to the Mecca (the waiting time can be up to 36 hours). 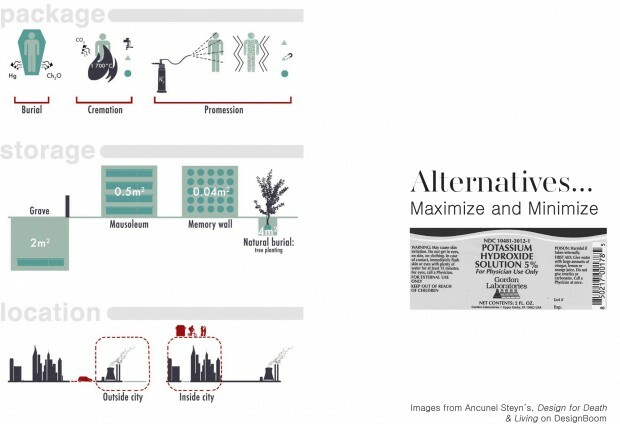 The academic research about socio-environmentally responsive design for extreme climates began with the analysis of an existing array of projects that the “networked urbanism” unit developed during a studio course at the GSD in Harvard. During these studios the students worked on a few ideas to improve the public space in the city of Muharraq, Bahrain, an area which climate conditions can be easily defined harsh and extreme. The aim of those projects was to foster the use of public space, in a city where public space is not only often abandoned and absent but also where the right to meet and gather is strongly discouraged. The ideas the students came up with generally had a technological approach, most of the projects contemplate the design of new devices and systems that combined the use or reuse of local resources to mitigate the extreme conditions of the climate. 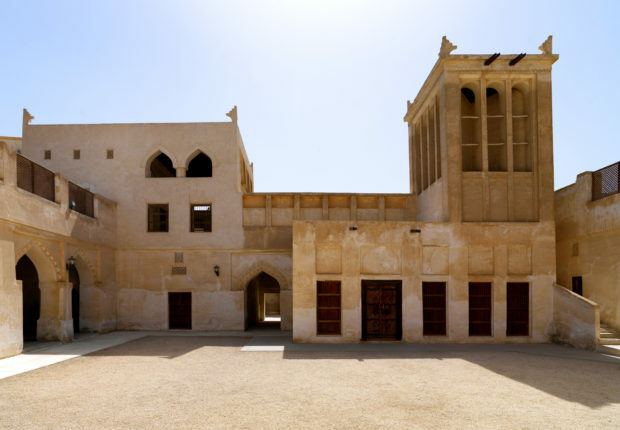 Breathing Streets considers the streetscape as the new form of public space for the city of Muharraq, due to the lack of proper public space the streets have transformed into the new social hub and gathering point for the citizens, especially at night when the temperature lowers. Breathing streets deals with the microclimate of the streets intervening mainly in three aspects: shading, lighting, and cooling. The system is composed by a main element placed in an open plaza constituted by a textile membrane structure that mechanically pumps cooler air to the adjacent streets through secondary textile tubes and creates a chimney effect that allows the hot air from the plaza to escape upwards creating a fresh air current. The tubes are provided with LED lights to provide lighting to the otherwise dark Muharraq streets. 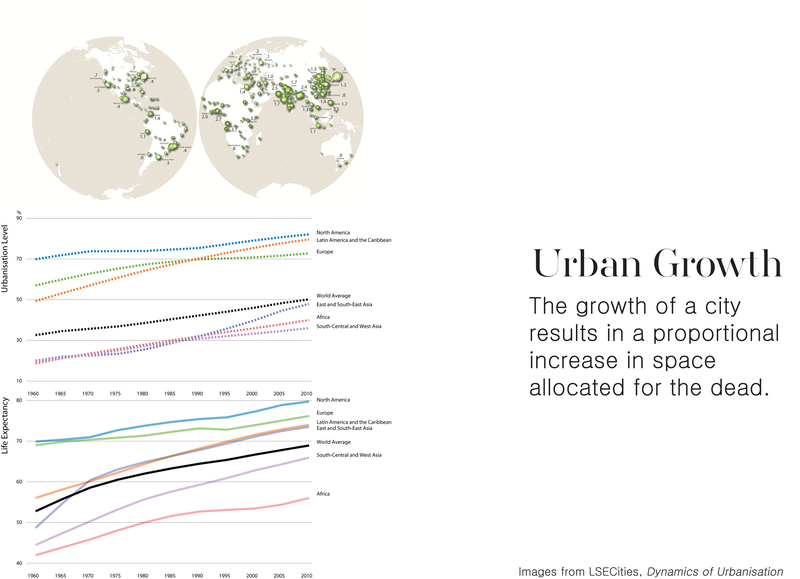 Since the beginning of civilization and urbanization, humanity has adapted its form of settlement and building to the specific climatic conditions of the area as it is known that climate influences, in a way or another, every human activity and that some areas in the world are way less hospitable than others. Already in the 5th century, the roman philosopher Macrobius (and later Sacrobosco in the 13th century) divided the “globus terrae” into five areas, two of them denominated “temperata habitabilis”, approximately corresponding with our temperate latitudes, two polar areas, named “frigida septemtionalis inhabitabilis” and “frigida australis inhabitabilis” and finally a “perusta inhabitabilis” (that might be translated into “scorched by drough”) corresponding with our tropical and equatorial area. 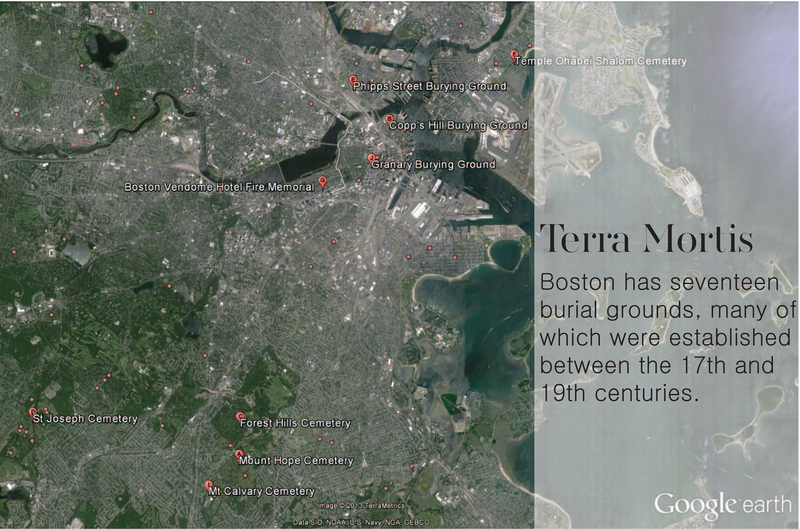 Cemeteries are at the center of a growing urban issue – with higher densities of the living we will inevitably face higher densities of the dead. However, while a number of designers and scientists have considered alternatives that either minimize the spatial requirements of human remains, suggest new dispersed, layered, digital or environmentally friendly typologies or combinations thereof, few have looked at the cemetery as part of a larger urban material ecology. Thought provoking as the alternatives are, they can often inspire less thought and more provocation. The rituals of death are deeply ingrained and culturally significant, therefore, rethinking cemeteries requires designers to allow for traditional modes of mourning. Even if a significant portion of society were to accept the possibility that their bodies will be flash frozen and ground into a compostable powder, we already have a legacy of spatium mortus – land that is sacrosanct and untouchable (at least not without significant cultural and emotional backlash). In response to this dilemma, I am proposing a layering of programs within cemetery grounds that goes beyond recreational use to turn cemeteries into productive spaces while maintaining respect for cultural norms. 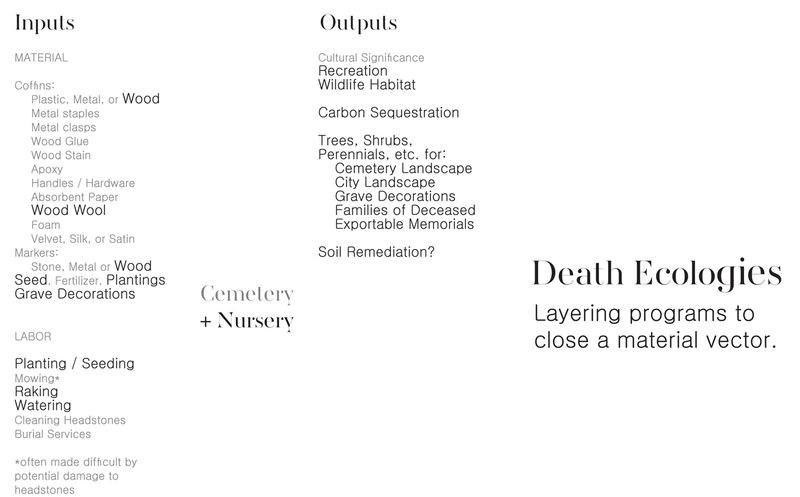 In simple terms a cemetery is a single-program urban space with specific material inputs, and no material output. However, that does not always have to be the case. 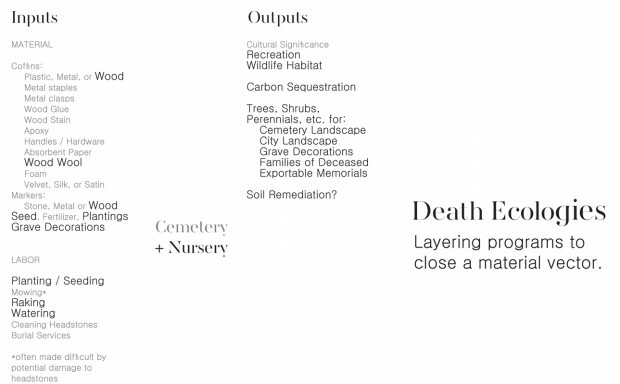 By breaking down the underlying systems of cemeteries, the possibility of closing a material vector emerges. Seeing as cemeteries are already organized into a field of plots with specialized and complicated maintenance regimes, the addition of a plant nursery is almost intuitive. While the growth of hardwoods necessary to close the container to container loop is a lengthy process, species with shorter growth schedules can be underplanted and either used within the cemetery or exported for profit. 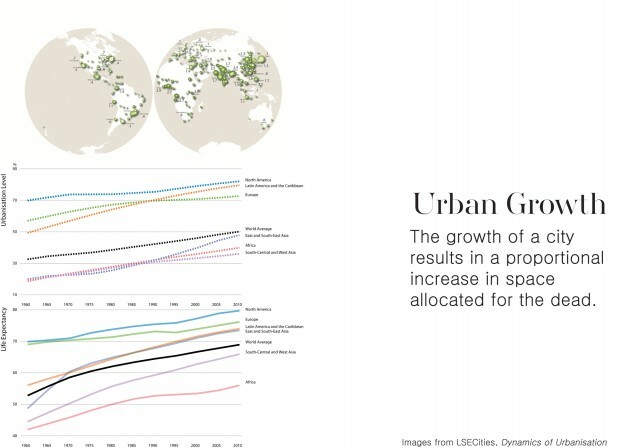 All the while the visitors and local ecosystem benefit from the well-studied beneficial effects of urban forests.